Im back! So, please dont be to hard on me. Yesterday I started the dreadful journey to clearing our swamp of a pool! We opened a business in June of last year it has consumed me so our poor pool was left unattended. I spend more time painting furniture and than i do thinking about our pool. Honestly..... i want to think about coming home to a sparkling pool. I am ashamed of it. I put it off. But i want to gain control of it again. Ok, I have so far used 11 gallons of bleach and this is my progress. Its cloudy! I know that means I'm killing the algae. Yay right! I tested using what i had on hand last night. Im on my way to get new reagents today. We are loaded with pollen here in Savannah GA area so it is not pretty. Im brushing, stirring, backwashing and hoping to fight the good fight. This is our 3rd year. Never been this bad. What do y'all suggest based on my results? You are on the right track. Just maintain F.C. Around 10 and keep brushing daily. Run filter 24/7 and backwash as needed. May take a while. Several days at least. After clear bump up cya to about 30 or 40. 2 days! Here we are! You can skip all the tests during a SLAM except FC and occasional CC, especially pH since the test is invalid with a FC > 10. Looking good, don't forget to brush! The pictures tell the story! You are winning! Don't let it get you down. 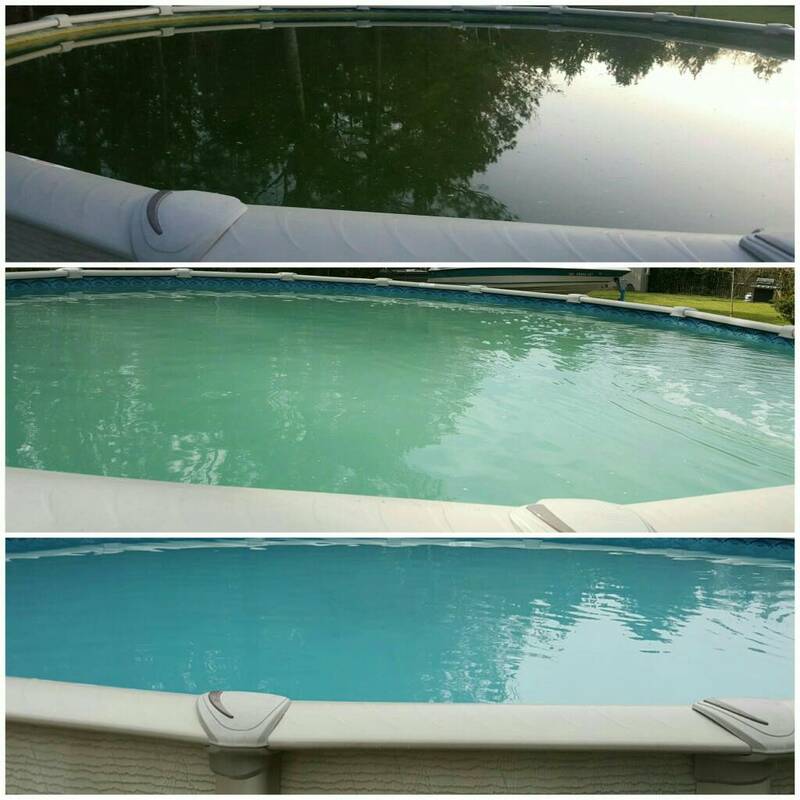 Soon your pool will be clear! Its coming along nicely. Have you been vacuuming the pool too? That will get out any debris that has settled on the bottom of the pool. Might do a DE add in the filter - this seems to help me get the last bit of cloudy out of the pool! DE does add that last little something to the polish when added to the sand. Well I can see the bottom! Needs to be vacuumed again. I had to add a tad bit of clarifier to make the small particles big enough to be caught in the filter. 3 weeks of straight filtering 24 hrs a day and we can see the bottom! My son (18yrs old) volunteered to get in and vacuum up the center debris. And we have progress! Our numbers are good now if the water would get warm! And i think its almost there! Can not wait for pool weather! I will update the final sparkling clean outcome soon! NICE follow up!! I like your polka dots pants and shoes! Cute socks as well!